The word "periodontal" means "around the tooth." 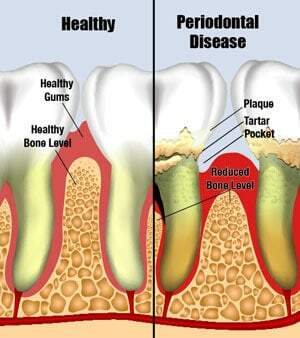 Periodontal disease (also known as gum disease, pyorrhea or periodontal infection) is an ongoing bacterial infection in the gums and bone around your teeth. This infection leads to an inflammation under the gums, and if not treated, this inflammation can destroy the bone around your teeth. This results in tooth loss. Approximately 75% of all adult tooth loss is due to periodontal infection. The Stages of Gum DiseaseHave you ever gotten a sliver of wood caught under the skin of your hand? Because the wound is open to bacteria, the site may become infected and so appear red and inflamed. In time, your immune system fights off the bacteria and your hand heals. A periodontist is a dentist who specializes in the prevention, diagnosis and treatment of periodontal disease. Periodontists have also taken advanced training in the placement of dental implants. Periodontists receive extensive training in these areas, including 2 to 3 additional years of education beyond dental school. Periodontics is one of the 8 specialties recognized by the American Dental Association. Periodontists also provide other treatments, such as crown lengthening and bone regeneration.